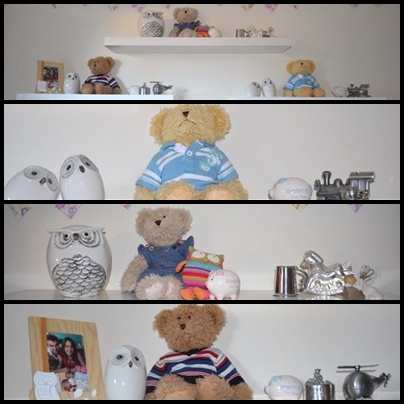 I’ve been wanting to do this post for awhile, and when I saw that Kelly’s Korner was having a link up, Show Your Life – Kids Rooms and Nurseries I knew this was a great motivation to finally get the babies owl nursery on the blog. Unfortunately it’s taken all week to get the room to photographing stage! 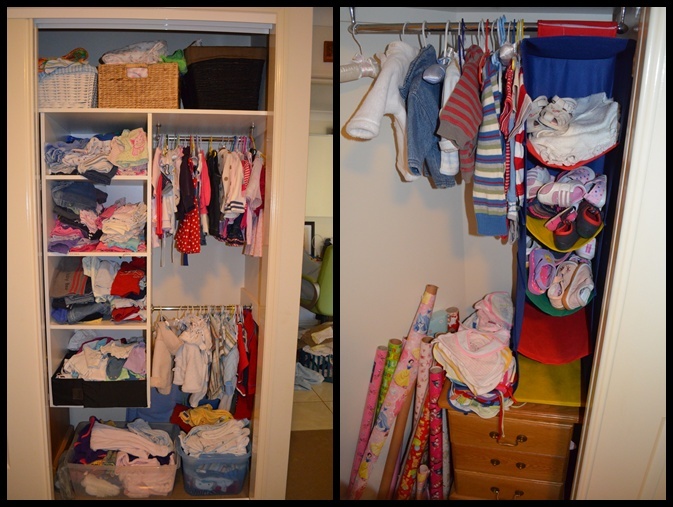 It’s really hard to keep a tiny triplets nursery tidy. (Who am I kidding, it’s hard for me to keep anything tidy.) Anyway, I’ve just managed to remove the boxes of clothes that don’t fit anymore, mounds of blankets and various boxes of miscellaneous items. Even still, there’s some things that remain like the storage under the cots. Got to put all the spare nappies somewhere! So here is the view from the door. 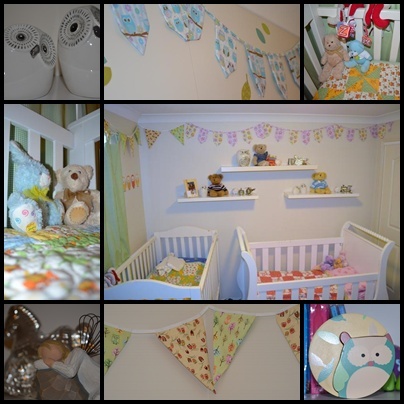 I chose an owl theme, since owls are popular at the moment and a great gender neutral choice to suit both the 2 boys and a girl. The other side of the room. Another friend made the cute owl mobile on the wall. Most of the owls have been gifts. A few details from the room. A friends mother in the US blessed the socks off us by making each triplet a beautiful owl quilt. Another friend blessed us by giving us two cots they had stored. I would have loved three matching cots, but it really wasn’t in the budget. At least they are all white. The sleigh cot was ours previously. I made the bunting for my baby shower. I think it makes the nursery look nice and cheerful. The cupboard. It’s a bit of a squish to get in one side since there’s a cot in front of it, so I don’t put things we use every day on that side. (Plus it houses wrapping paper, always an awkward one to store!) The other side, is absolutely chockers with clothes. I don’t know what we’ll do as their clothes get bigger! There’s a simple little picture above the door which is one of my favourite inclusions in the room, for sentimental reasons. It’s a copper picture that my grandparents made me for my 1st birthday. I love that there are three little ducks. Perfection! I love the floating shelves we bought from IKEA and Bunnings. It’s a great spot to put some special things given to each child. A closer look at each shelf. Grandma has given all her grandchildren a special teddy bear. They also each have a very special Royal Selangor pewter object. Their money boxes were given by their Great Nana, and the piggy banks by a Great Aunt. They kind of have an over supply of money boxes, there’s more on the other side of the room too! But they are all so cute. Never to early to start saving. They are Accountant’s children after all! 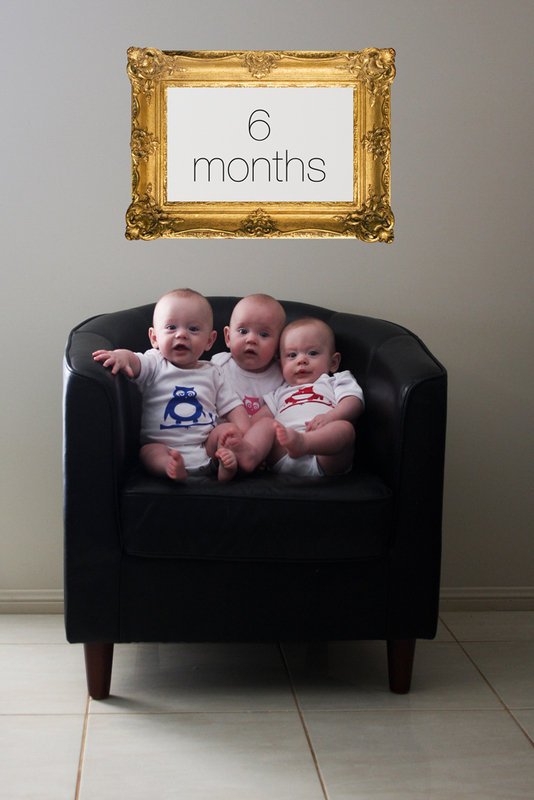 The triplets are concluding their 8th month. I thought I’d update you on their progress. The pre-dominant precaution in our house at the moment is to watch your feet as you walk, lest you step on a baby. They can pop up anywhere and everywhere. The boys are well and truly on the move, and now motor around on all fours. They also pull themselves up on furniture and toys and bob up and down as enthusiastically as any well bred parrot. This also means that they can grab lots of things also, so nothing within triplet reach is sacred. Toby hanging out under the piano. Little Imogen is also on the move. Slowly but surely. She chose not to rush into this new phase of life and spent a pro-longed period rolling to her destination, avoiding any long distance trips. In the last fortnight, she has decided to venture further into the world and will plod along on all fours. The poor little darling really is a delicate little petal. The little crawling she does results in bright red knees. If you didn’t know better, you’d think she’d crawled a marathon compared to the boys. Looks are deceiving. Little Immy. Having a slightly miserable day. Nothing like a bit of music to lift the spirits. The three of them are like little worms when they are together. It doesn’t matter who you need to crawl over to get to your destination. It really survival of the fittest. Jayden is normally the bully of the group. Imogen is normally the most picked on. Probably because she can’t crawl away quickest and doesn’t fight back. However she will protest very loudly and has a “My brother is picking on me” wail. I expect she will learn the words to this protest imminently. There is also a lot of dummy stealing that goes on around these parts. Jayden particularly is merciless, and has been known to claw another’s face before plucking the object of his affections from someone else’s mouth, and plonking it in his own. The baby boys are partners in crime. The will often get into things with one another. It amazes me the special connection that is obvious between the identicals. When you put them down together, they will eyeball each other and laugh or squeal at one another. Busted! Conquering Grandma’s Tuppaware cupboard. The babies had their first trip to Grandad’s large western farm. The last time I went there I was pregnant with the triplets. You can read about that trip here and here. The babies mainly stayed in the house, but loved being around all the family. They travelled really well once again. It took about three hours to get there, so I’m so proud they are such good travellers. Our Nanny, Miss Rachael came also. Click here if you want to read her account of the trip. Of course the big boys had the time of their life playing with their cousins, catching yabbies, riding the tractor and flying in the plane. Aunty Katrina with my boys and her boy. They look like they could be brothers rather than cousins! Miss Rachael adds the girl into the mix. Grandad with the bush babies. iserable and irritable with all the signs of teething, but no teeth yet. It has also meant they all have been sleeping badly, well worse than usual. They still have not mastered sleeping through the night, it’s rather exhausting Alex and I. We had got into a pattern of getting up 2-3 times a night. But since they have been sick, it’s probably averaging 6-8 times a night. Alex is amazing, having to work the next day, I know I continually feel like my head is in a fog, I don’t know how he does it, but I so appreciate that he helps me out at night, bringing the babies to me, putting dummies in and a pat on the back or even just waking me. He’s a light sleeper and I’m not. It is so very tiring, but it’s only a season, we will get through it. I look forward to seeing them continue to progress. They are starting to talk a bit more now. They all say “Dad” (most of the time, humph. ), “Mum” (when they are crying. Double humph.) and Imogen and Jayden say “Bub” and Jayden says “Hello”. (So cute!) Toby is a bit more sparing with his words. I know it sounds silly, but after having four baby boys, I just can’t get over how cute Imogen’s voice is, she is so girly! I never thought that babies had girly voices, but it’s more high pitched and sweet and sing songish. It’s lovely. So, that’s what the trio is up to at the moment. I can’t believe they’ll be 9 months on Saturday. They have now been born longer than were in the womb for. We have been blessed. Every moment. Even the pooping, screaming, tired and exhausting moments. Totally love my kids, all of them. I thought I would pause in remembering the triplets births and update you on what they are doing in the present. My wonderful trio are now 7 1/2 months. They are growing up now ever so quickly. As I see them grow I am constantly aware of how richly blessed I am to have them in my life. Seeing them grow up also makes me realise that babyhood is so brief and before long it will disappear. It makes me a little sad, even though I know life will also become a little easier in many ways. For now, when I carry a sleeping baby to his or her bed, I cherish every moment they are in my arms. When I kiss their little heads and stroke their chubby cheeks, I want to remember the moment for ever. When they look up and laugh, their eyes dancing with delight, I treasure the moment in my heart. I am so richly blessed, more than I ever could have imagined. Two feeding while one looks on. The babies sitting up, although they do still topple over, so you need to be ready to catch or have some pillows need to be close by. Miss Im particularly likes to sit up and survey her domain. Alas, compared to the boys she is rather unco-ordinated (takes after her mother), so you need to be especially careful because she will fall over doing a wonderful caricature of a lead balloon. The boys are a bit more rolly polly as they fall. Little Immy might be the least active of the trio, but we forgive her since she is a totally awesome sleeper. (When she is not sick.) She will often fall asleep when she’s tired on the floor. Here rests my little bunny, cottontail and all. By the end of their 7th month, Imogen can sit very confidently, but crawling isn’t on her agenda. The boys have well and truly mastered the commando crawl. They now can get wherever they want throughout the house. The triplet’s favourite place to hang out these days is on the mat. This is fairly typical, boys moving around on their tums while Missy looks on from her stationary position. The boys on the move while Immy supervises. I’m still grateful that they are fairly slow, so generally you can see them heading in a direction and five minutes later you’ll know the general area in which to find them. Even still, I’ve misplaced Jayden a few times. They’ve been sick, poor darlings. It’s the reason the blog posts have been few of late, and the reason this post has taken so long to write. They are getting up many, many times throughout the night. We’re all tired. I think this group of photos really show how much they are growing. Here are each individual photos. They were so tiny during the first month. We had to find something to prop them up because otherwise they were lying down and you could only see their feet. It’s a bi hard to see the difference here in size, but they do have a little more flesh on their legs, and they definitely had grown! You can’t tell, but they were all crying in this picture which certainly reflected what life was like in month 2! More crying in month 3. Such was life. It was Christmas time, and so reflected in Missy’s onesie. You can certainly see they are filling out more of the tub seat this time. Hooray! Smiles have started! It certainly reflects that the sore tummies from cholic and reflux are starting to settle down. 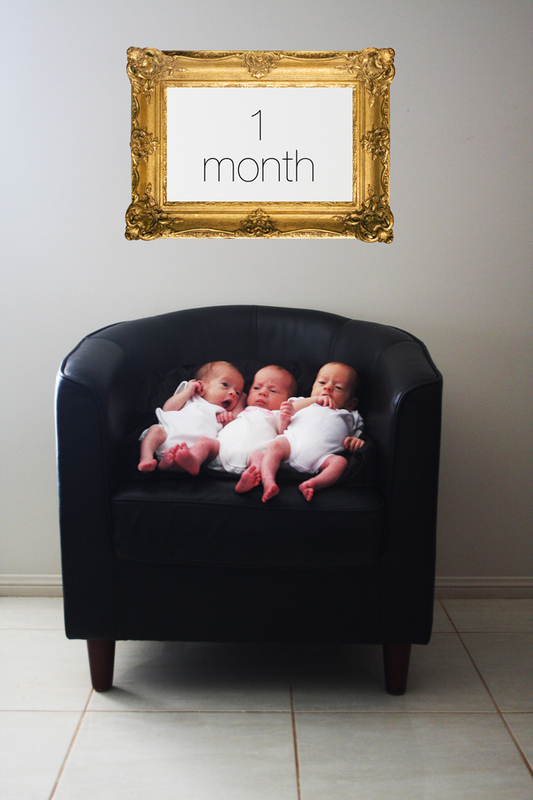 Here’s the month where they were puking ever so much – therefore the colour appropriate bibs! Isn’t it cute how Missy and Chook are clasping hands? I love Joey’s little hand resting on the couch here. Poor Chook’s sleeping away, and Missy was starting to feel squashed! 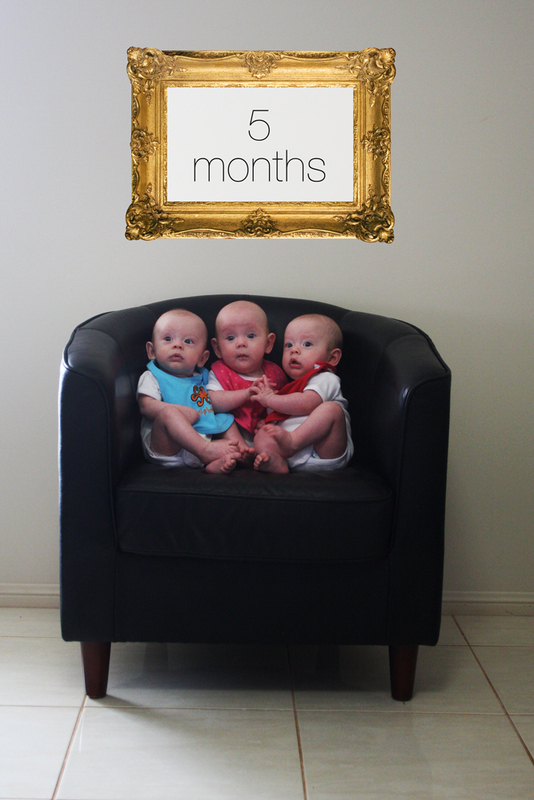 The triplets are now seven months old – I suppose I ought to schedule another shoot! My goodness. Busiest Mother’s Day ever. Loved it. Cherished it. Heartwarming. Gooey. Moosh. But … BUSY! The triplets are eating solids. Three.meals.a.day. AND they.still.breastfeed. Tick tock, tick tock. More time is required to accomplish all these everday tasks. Which makes it a tad tricky getting out the door for church. The truth is, we have always found it tricky getting to church on time. Getting to church on time with triplets. A lot more tricky. Not impossible, but very rare occurence. Now with feeding solids there’s an extra challenge. I’m sure in time we will sort a rocking red hot routine. We are certainly not there yet. I’m still at the lining three up, showing rice cereal in as fast as possible. (Baby girl refuses to be hurried.) Spoonful toT1, Spoonful to T2, Spoonful to T3, repeat, repeat, repeat… Of course T3 (baby girl) interrupts the rhythm, therefore decreasing her share in the rice cereal goodness. Other interruptions to the rhythm include sneezing (Otherwise known as “Let’s see how far we can spatter food in as many directions as possible), twisting and turning in the seat to put mouth in the most difficult to reach place, and crying because “the spoon is taking too long to reach my mouth and I’m so hard done by because I’m a triplet and I have to share all the time” often results in the irony of delaying the food reaching the mouth. To hurry the process up today, The Accountant and I had one bowl and two spoons and we were both stuffing food into the three hungry mouths as quickly as we could. If the mouth was empty, we’d stuff a spoonful of rice cereal its way. You can speed up breakfast, but there’s always going to be dirty nappies to slow you down. And then of course there’s still the two older boys that need to be dressed, fed, questions answered, figting to be dealt with. My boy and I – PJ Perfect! ﻿ Oh, and it turned out Mother’s Day was foot warming as well as heartwarming. I got the classic Mother’s Day gift – slippers! Lovely pink wool ug boots. I’ve so been enjoying walking on them before the wool is squashed in. It’s like walking on clouds! Anyway, we got to church about half an hour late I think. A tad embarrasing. 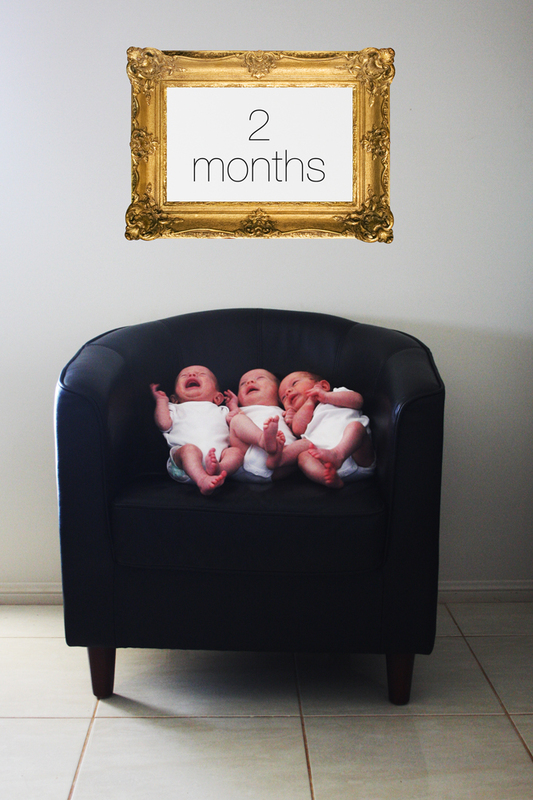 Because you know, there’s no way of making a discreet entry when you’ve triplets. Even if you are ‘slipping into the back row’. For now, we celebrate that we still make it to church. Getting there on time. It will come. I was fondly remembering as I walked into the service, my announcement to the church last year telling the church I was pregnant. During the service all mothers who had babies in the last 2 1/2 years were asked to stand. I did, holding up three fingers. Later I realised I’d miscounted. I’ve had four babies in the last 2 1/2 years. Way to go Caitlin! I don’t think that the fact that just because the day can be heartbreaking for some, it should be any less celebrated. Yes, we need to be sensitive, but also motherhood should be celebrated in fullness. Motherhood is worth that. I think that just because the day is difficult for some, does not diminish the joy that can be enjoyed by so many mothers. For me, I looked forward to this day for so long. I cried because I couldn’t celebrate it, and now I can, I make the most of it and cherish every moment. I read another article this week by a childless UK woman this week saying mother’s shouldn’t whinge because they are so lucky, and others miss out on kids. As much as I acknowledge her pain and the heartbreak of being childless. I can’t agree that mother’s shouldn’t ‘whinge’. After all, if she has a right to whinge about other’s whinging, well, it’s automatically not fair, isn’t it? Everyone should be able to vent with that which they are finding difficult. Childless couples should be able to talk about their hurt as much as mothers shouldn’t bottle up their struggles. You can be grateful for the chance to be a mother while at the same time as being frustrated with the fact that there’s poo smeared over your child, food squashed to the wall, kids screaming and you have a throbbing headache. Sensitivity is the key. If you knew that someone was struggling with the lack of children in their life, well, don’t rub it in. Although, I must admit, when I was childless, I had a friend who wouldn’t talk about her kids very much at all to me. She was trying to be sensitive, but I found it hurtful. She couldn’t talk to me about what she did every day any more. She wouldn’t share her struggles and triumphs. She shut me out of the most important aspect of her life. Consequently, the friendship died a natural death. I just no longer felt comfortable sharing all about my life to her because the conversation was not reciprocated. Anyway, I digress. Seems like I’m feeling opinionated tonight! To sum up the rest of my Mother’s Day, my sisters and our families went out to lunch with Mum, Nana and my Mother-in-law. It was lovely, and of course it’s always super dooper when you don’t have to cook or clean up. The rest of the day was fairly ordinary. The Accountant had a long sleep in the afternoon, leaving me with the kids – I suppose fitting that I should mother on mother’s day. I hadn’t prepared anything because I thought that hubby was making dinner with J Boy, who was wanting to do a candlelit dinner. Obviously my son is more romantic than my husband, and with the babies being fed their solids and breastfed, bathed and put to bed, we ended up having leftovers, and I was breastfeeding and ate after the rest of the family anyway. (A familiar scenario at the moment, the babies always seem to be ready to settle down during dinnertime.) No candles present. So what are your perspectives on Mother’s Day. What did you do on this day in 2012? And another little question – just curious – I’ve added a lot of links in this post – did you click on any? Hey there. I’ve got three babies asleep, so I thought I’d jump on and write about the process of achieving this temporary state of peace in our house. It may entertain you! Or, it may comfort you to know that all mothers have our busy times and we always ‘get there’ in the end! It’s one of the reasons I write this blog is ‘to keep it real’. I think that when we share our stories it empowers others because we realise that there are others out there who are experiencing similar challenges. So. This morning I had no helper. I’m getting braver these days, and there are several mornings a week when this happens. Normally during the couple of hours by myself there is a busy time where two or three babies are very demanding. I’ve learned that I just stay calm, address one baby’s needs at a time starting with the bub making the most noise and before long we pass through the storm. This morning it was three babies being demanding. When I got surfaced after my morning shower, I could hear fussy babies. With me out of the bathroom, The Accountant headed in to do his morning routine so I had no one to hold bubs. I decided I needed to leave the babies fuss, predominantly Imogen, who was making the most noise, because I needed to make Jonty’s lunch for school. I didn’t get very far, because Imogen was terribly, horribly hungry, so she informed me vehmently. We reached an agreement that she would downsize voracious crying to mild whimpering if I carried her around the kitchen while getting lunch box components. It was OK throwing in things like biscuits, chicken (already wrapped last night, phew!) peeling a mandarine was possible and even chopping an apple. (Jonty only eats fruit that is pre-cut.) I had to put her down to make a sandwich, she had been settled down somewhat so she begrudgingly allowed this for a short period of time. All the while I was shoving dummies (otherwise known as pacifiers!) into the other two babies and I had to constantly was reminding Jonty to get dressed, put on socks and shoes etc. He had slept in and was slow to move this morning. Once the lunch was made, the other two babies were also getting noisier. I started to make a bottle for Imogen and some solids. Generally I feed the babies separately, (I’ll try to write another post about how I have been feeding them solids), but this morning I thought I’d have another try at feeding all three at once. I made a smaller bottle for Imogen since she and Toby had already been breastfed. I wanted to give her solids first to try and keep her tummy full for longer though. Before The Accountant and Jonty headed out the door, The Accountant re-arranged the babies into different rockers and bouncers, which served as a temporary distraction and cut the noise level for a bit. So, I started feeding Imogen on her own with a big bowl of cereal, but I had two bumbos (our preferred ‘high chair’ at the moment) on the table ready to include the boys when it was necessary. As expected, Toby soon grew sick of his bouncer, so he came to the feeding frenzy also. Feeding two. They were OK with that. Phew. This isn’t always the case. All good. Then Jayden started protesting, so he joined in also. Imogen started slowing down with the solids, so I stopped feeding her and continued to feed the boys. She was still disgruntled, so I pleaded with Trent to fetch her bottle that I had left out to feed her. After a lot of coaxing (I couldn’t leave the boys in their bumbos on the table, totally not safe.) the bottle was finally obtained. She was in the high chair, so I put it into recline and held the bottle for her while feeding the other two. After a while Toby slowed down eating, but wanted a drink also. Imogen seemed happy enough, and since she’d already had a breastfeed, I knew she wasn’t starving so I transferred the bottle to Toby and continued feeding Jayden solids. Imogen was happy enough for awhile, but then she began grizzling again. I ignored her and eventually she fell asleep in the highchair. (She’s the only one out of my 5 kids that will just fall to sleep like that!) Meanwhile, the solids were all finished, so Jayden was starting to fuss. He had been breastfed in the early hours of the morning, so was obviously hungry. I took the bottle off Toby, who wasn’t entirely happy, but I figured he also wasn’t starving. I grabbed the two boys out of their bumbos, plomped Toby in the swing and turned it on. He kept grizzling, but also fell asleep eventually. This left me finish feeding Jayden. Of course the bottle wasn’t enough, (I was wishing I had made a bigger bottle at this stage), so I had to make another bottle with one hand while he cried even though I was holding him. Once the fresh bottle was made, he fell asleep before the bottle was finished. That’s when I got on the computer. Since then Imogen awoke and finished the bottle and is now on the floor playing. It was 35 minutes from when The Accountant left the house to when all three were asleep. It seemed so much longer!!! This is why I take any help that is offered. It’s completely possible to do it on my own, but it makes life so much easier when another person is able to help. It’s also why I do it on my own sometimes now. It’s normally not such a long time really, it just is really busy and seems longer! Here’s some pictures I clicked of the aftermath! I suppose I should go and clean it all up now! Missy fast asleep. So cute with her little legs resting on the tray! The wider scene, complete with basket of ironing! Empty Bumbos. The cup behind them was full of water left by T-Star which got spilled everywhere when Joey reached behind and grabbed it. Toby asleep. Thank goodness for ABC 2. It kept Trent amused during the whole ordeal. So how has your morning been? What is your busy moments when you regularly need to keep a calm head and eventually you’ll get through to the other side? When my face was vomitted on before I even got out of bed yesterday morning, I should have known it was going to be an average day. Alex had brought Toby into me and I had fed him and he had been sleeping and starting to squirm. I had been ignoring him, trying my best to squeeze a few more ounces of sleep, (hey, I take whatever I can get these days), when I realised that he was moving around because his tummy must have been hurting. I started to move the baby into an upright position to burp him, when all of a sudden the vomit came, and somehow his face was positioned exactly at my face. Thank-you projectile puke. I left Alex with the baby and had a shower. I thought I may as well start getting ready early because I was planning on going to town with the kids. Normally I have a lovely older lady who comes and helps me Thursday morning. Since she’s not able to make it for a few weeks, I thought I’d try to go to town. It would be something to do, and I wouldn’t need to rearrange anyone’s schedule so I could do so. Probably won’t do that alone again in a hurry. The plan was to go with Mum and possibly my sister. All I had to do was get Jonty and The Accountant off to work and school, feed the babies, dress the kids, gather our stuff, get in the car and go. Oh it sounds so easy. By 10:00am I was close to tears as I struggled to find the exact angles to load a double stroller and a single pram into our car. There’s no boot space in the car, and the only reason I could take anything extra at all was because I could fold Jonty’s seat down. Trent needed to be strapped into his car seat first because there is no way he could get in once the prams were precariously stacked beside him. I had been feeding and feeding. The babies still breastfeed, but you never know if they are going to be satisfied after a feed or not. Yesterday they all needed top ups of formula. I would finish feeding one, try to do something, and then need to give someone else a bottle. It just kept going around in circles. Then getting them dressed, only to have to change another one shortly after, or worse still, re-dress because a dirty nappy had leaked. In the meantime Trent was keeping busy playing with playdough, getting toys out and generally being a good boy, but making lots of mess. By the time I left at 10:30, (Just as well I started getting ready early! ), I had come up with another plan. I left Trent to play with Grandma, thinking I’d meet up with my sister who was already in town. At the last moment, Immy stayed also, since I hadn’t had responses to my text messages to my sister. Just as well, I never did meet up with her, but spent a morning rushing around with the boys pretending to be twins. We didn’t really get much of what we wanted in town. We returned to my Mum’s and had to waste time waiting for Trent and Imogen to wake. Back home. Feed time again. Try to clean up. Interrupted constantly so didn’t get too far. Sometimes it can be so frustrating with baby triplets. I just wish that I could make my own mess, (You know, coz’ that’s what I do), and not have to worry about anyone seeing it. And then I wish I could have un-interrupted time to clean up my own mess. At this stage, there’s always others cleaning up after my family and I. Which is nice. And necessary. But who would have thought cleaning up after one’s own self could be so liberating! Not that I clean up after myself necessarily when others aren’t around. I tend to do other stuff, like blogging, that I feel guilty doing when others are around. Such a conundrum. Anyway, to continue with the day. It ended taking Jonty to soccer training. But he was in “Don’t listen and roll around on the grass instead” mode. Fairly frustrating. When we got home, the babies were extremely unsettled. Because soccer finished at 6:00pm, dinner had been prepared, but was waiting to be cooked. I couldn’t put babies down, so I couldn’t make the stir fry. Then my husband arrived home late. Of course he got in and helped straight away, but the boys still got to bed quite late. The babies got to bed extremely late. They just haven’t been settling in the evenings lately. We were up three times overnight. Not such a bad effort. Hopefully it’s a better day today! 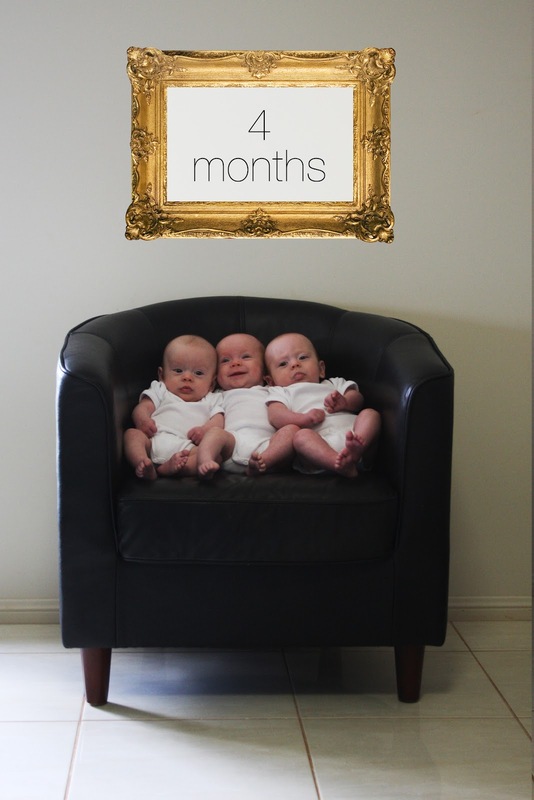 Just as well the triplets are this cute – it makes them very easy to forgive for our new discombobulated style of living! The baby boys are getting easier to tell apart. Here they are in January. Easier to differentiate between the two.